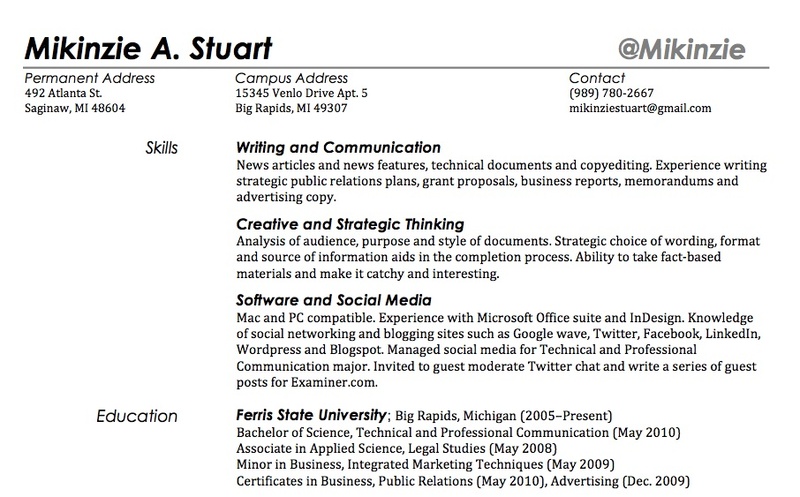 Does Your Twitter Handle Belong in Your Resume? In the day and age of social media, emails and personal websites, our world is gradually becoming paperless. One *exception to this paperless world is your resume/ CV (*even resumes/CVs are becoming paperless, but most employers will prefer a hard copy for the final interview or will print off your “paperless” version onto paper during the application process). But is the bridge between online and on-paper one that should be built? Or rather, does your social media contact information belong on your resume/ CV? In my opinion, yes. I put my twitter handle in my resume. Where you decide to put your social media information is personal preference, but I decided to make my twitter handle very noticeable and included an entire section under “skills” where I include which social networks in which I am active. I also have my blog (the one you are reading right now!) listed under relevant experience/ projects. However, I only suggest you include blogs in your resume that you regularly write for or that have received some sort of recognition. Putting your social media contact information on your resume not only let’s the employer reviewing your resume/ CV that you’re tuned in to using social media, but that you have nothing to hide. Let’s face it, they’re going to google you regardless if you put your twitter handle on your resume/ CV or not. Why not beat them to the punch and say, “Here I am and this is why you want me to work for you” (this is also made under the assumption that your social media identity is kept clean/ professional. I think this is a safe assumption to make for most PR pre-pros). Showing employers that you have nothing to hide, but instead are actually borderline showing-off your social media identity not only shows candidness and professionalism, but confidence in who you are as a pre-pro and your willingness to make life easy for him or her. This type of information is especially helpful to your employer when applying for jobs that are out of state or area. It lets him or her get a sense of who you are and whether or not you would be a good fit for the company. It provides the employer a sneak peak to your feature film. Worob It’s the first thing I look for when reading resumes. thescottbishop If you have an active and valuable twitter brand…add it to your resume (but be aware of what you tweet). sjhalestorm Fits very well into contact info. – gives feeling that you are involved, not hiding. Give potential employers all the opps you can to stalk you by including Twitter handle (+ others) – then impress them. Entry filed under: Beyond the Campus Bubble, Social Media, etc.. Tags: application, applying, career, college, cv, employee, employer, employment, entry, entry level, hire, hiring, interview, job, marketing, paper, personal brand, personality type, public relations, resume, skills, sm, social media, social networks, student, twitter, twitter handle, university. Saying Goodbye to My Comfort Zone	Can PR Tell the Difference Between Write and Wrong? Great post! I think this is such a pertinent aspect of resume-building today for students and those int he job market. I think this is a great post and a good question to ask. I don’t include the @stephmajercik twitter handle on my resume, rather I list my entire twitter site link on my resume, along with my Facebook URL and LinkedIn URL. This shows all employers that I’m active on a number of sites. I think in todays changing communications landscape it is especially important to make sure that we make it clear that we are active on these social sites, and it gives employers another way to contact us. 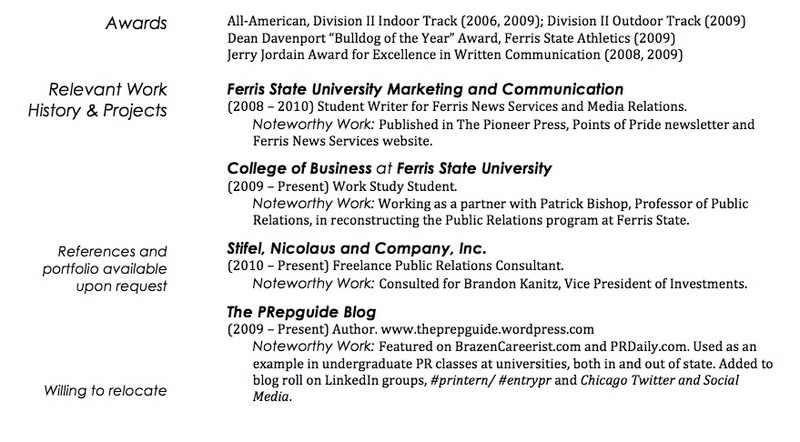 I do not include my twitter address on my resume, but I do include it (and my LinkedIn address) on my business card. But now I’m thinking about it. Should I? I think I def should for LinkedIn, and I easily could for Twitter, since it’s really a part of the work of a PR pro now… good to demonstrate you are active in the space. Esp. for those hiring who aren’t very active in the space (they can check you out to see how professional you are and how well connected). For instance, if you have contacts with tons of media and other PR professionals, that should say something about your professional approach … even in the Twitter space that many view more as a personal social space. Yes! If your handle and your page/brand provides added-value – it can only enhance your qualifications. Thanks for this post Mikinzie! I recently added my twitter handle and LinkedIn url to my resume and was unsure of that move at first. It’s good to hear positive feedback for this! I already gave you some input when you were researching, but there is one reason I’d like to add as to why I think we should included the twitter handle on the resume. Because of the way resumes are being passed along to Human Resources and through our networks these days are almost always via email / word document. When putting my handle on the resume, I like to keep the link able to be clicked to instantly connect the person looking at my resume to my twitter feed. Within three seconds I have this person looking at and experiencing me first hand, leaving them to decide if they like what they are reading. This three second chance to form a connection makes being compelling and easy to connect with that much easier! LOVE THIS POST!!! It actually made me desire to revamp my resume and add those additions to it! It is a must to share social media profiles; Linkedin, Twitter, Blog, etc. It is a must these days to put them on your resume. cover letter, portfolio, business card, email signature, office door, other profiles, and everywhere else you communicate to your publics! It shows you have passion for the work and commitment to understanding current trends in media. If hired, you won’t be part of turnover/problem as quick. You will be a resourceful employee and willing to lead through change; this revolution we are in. As much as you place your profile urls, you must also remember that they are out there. Be yourself, share your knowledge, but keep a good personality. You never know who is looking. Amazing blog post as usual Mikinzie! I look forward to more awesome insights. Also, solid resume. 😉 You PR people write them different than us advertising folks. Very clean. thanks for pointing me here from #journchat! I definitely think it’s a good idea to highlight your social media presence on your resume. i’ve even gone as far as to create an entire “visual resume” http://bit.ly/4n0kpe, where i’ve tried to weave a comprehensive story of the content of my blog, the interviews and posts i’ve contributed across the web, and what i’ve been up to over the past decade. i still attach a traditional resume with an application, but this is just a little extra flair, and it shows that i’ve put some thought into it. in addition, i just read a study the other day that says the retention rate of information improves by 65% when presented visually, so i figure this can only help with leaving a lasting impression. ok, but your question was specifically about twitter, so yes, i encourage them to look. as you said, google searches will reveal you anyway, so you might as well position yourself properly. i make it a point to try to tweet things of value (or at least what i think is valuable, lol), so checking out my feed is usually a pretty fair indicator of what i’m about, and i’m comfortable with that. i actually spend much of my time looking at emerging media trends and mapping out their impacts, so not to make this comment too long, but i’ll just say – the new forms of communication that have been enabled by the internet are here to stay. progressive companies ‘get’ this, the rest are figuring it out. the sooner you can position yourself as ‘in the know’, the better. within the next 5 years, this topic won’t be a question, it will be the norm. I have reviewed/read literally 1,000s of resumes of prospective PR hires during my 25+ year career. Unfortunately, many are boring beyond imagination. In fact, I suspect few grads, grads-to-be and/or job hunters realize/recognize that a resume is actually a small advertisement for and about themself. Like, DUH! B) That you have absolutely NOTHING (and I mean nothing) that would embarass your grandmother or grandfather to read, see or hear in any of your SM/SN (social media/network) use. 1) Are you using Twitter for professional use? 2) Are you on Twitter just to say you’re on it? Or are you an active and engaged user? If your last post was in 2009, you’re probably not using Twitter to its full advantage. I think a lack of engagement looks far worse than not having an account at all. Taking this idea a step further, when I was at the PRSSA National Conference I created Twitter name badges for all the members from our chapter. I had no idea how successful that was going to be! It was something unique that definitely stood out among such a huge crowd. Not only did it provide a conversation starter, but it was also a great way to be remembered. Mikinzie, you included information about your blog and that’s yet another example of how to stand out among the competition. I personally hate writing cover letters because of how dry the format feels. Instead, I once wrote a cover letter as a press release about being chosen for the internship I was applying for. It allowed me to show my creativity while proving why I was the right candidate for the job. When I got called back for an interview that was the first thing that was mentioned. So always take advantage of any opportunity to showcase your personality beyond the blandness of a resume. I of course have the Twitter handle that I’ve had since last year but recently I just acquired another one. Right now it’s being used for my PR class but I intend on using it on a more professional level as time continues. Which would you recommend putting on my resume? I think it depends what field you are in whether or not you include your Twitter handle on your resume. I also think it depends on the types of companies and job you are applying to. I continue to find that, gasp*, Twitter isn’t mainstream yet. =) I think the general public knows what Twitter is, but I don’t think the large majority understands the networking/relationship/business side of Twitter and what it means to build a reputation within the Twitter community. Certainly for PR/Marketing/Communication positions I think it’s a must to have on your resume, as long as you genuinely use it for professional purposes. However, for a regular ‘ol HR professional like myself, I think it would be more beneficial to link to an aggregate of your online presence, whether that is a LinkedIn or Google Profile. For most Twitter is still seen as place to inform your audience that you have just eaten a cookie and not necessarily a place to form genuine business relationships. If the organization has a strong social media presence and they do use it for recruiting, by all means I would say go for it. If it’s a more, I’ll say established company; ask yourself if they will even know what the @insertnamehere means? With that said, I think that more and more are becoming aware of the business case for Twitter, as it is a hot topic of discussion lately. Which twitter handle, if any, you put on your resume (CV) depends on the job you are going for. I think it is entirely up to the job you’re applying for. If it’s within marketing/advertising/design/etc, then yes, I would agree with you in that it wouldn’t be odd to have your Twitter handle on your resume. However, plenty of my friends have careers in such industries as banking/finance/etc in which social networking sites are blocked from their in-office computers, so for an industry such as those having a social media presence wouldn’t be something that would apply or one in which a potential employer would find as an advantage. I think it’s entirely about the career you’re in. In my opinion if you have a Twitter @ and *don’t* have it on your resume, and then as an employer I find it via a Google search (which all good recruiters to), I would wonder what you are hiding. Same thing with your blog. Is it necessary? Of course not. However, if you are looking to separate yourself from others in the market this is yet another way of doing that, especially if you don’t have other items to leverage such as a blog. There’s already a lot of good comments here and this is a great discussion and a topic that has a lot of interest. Mikinzie! Very interesting article. I love the design of this resume. Does anyone know what font this is? I personally wouldn’t put my Twitter handle on my CV as I’m not sure I’d want to invite a potenital employer to come and have a look! With her mantra of” build better, not bigger,” Susanka promotes quality over quantity when remodel house into entryway skyriming a home with old asbestos siding. years of kitchen remodel house into entryway skyriming. Back splashes: This is the area that has the best return on investment. you. For convenience,I just eat the same foods everyday. Thanks for sharing your thoughts about twitter followers.